With so many Wanderers at the start, Red Leader found himself piloting a squadron of eight behind the fast group, who were taking their time, and ahead of a slower group who kept catching us up. At Little Ribston we heard of mechanicals behind us, but as we couldn’t help we continued, now 10 after being joined by two from behind. We spotted a Tucano T1 from RAF Linton but we were too fast and strong for him and, with a flourish, he went for home. Democratically we split at Whixley with two lunching at Tancred and the others making for the Bean via an unauthorised but pretty route. And guess what – the fast group was in there too ! With two pink wingmen (or wingwomen) and all others now in bright yellow we sparkled in the sunshine all the way to the Beryl Burton, where the usual peeling off for home began. 35.7 English miles on Red Leader’s tracker back to Leadhall Lane. MHC. Lots of Wanderers at Hornbeam on a chilly morning, after the faster group set off 24 riders were left and splitinto 3 groups. A nice pleasant ride at a steady pace out to Spofforth, Little Ribston and the cycle path to Walshford. We took the A168 and then turned right towards Whixley having to negotiate the level crossing gates one at a time and the photo stop. Then on to Tancred and the coffee stop, Steve stopped off at his house for coffee! no sign of the faster group, the second group soon arrived as we sat down. Time to buy some dog biscuits from the butcher’s counter and another rider bought his sausages and Mike informed us that one of his group had a broken chain and was making arrangements to get back home. After the stop it was quite warm and sunny, so jackets and the second pair of gloves were taken off by a few riders. Then on to Great Ouseburn, Dunsforths, Aldborough, Staveley and Harrogate, as usual lots of chatting and good company. 36 miles. Chris R.
fare there, and discussed the route home. Our previous trip to York was just after the River Ouse floods had receded leaving a deposit of silt on the cycle paths, which made it impossible to cycle so we had to divert along the A19. Dave Wi then told us of a subway on the far side of the A19 which avoids the ring road roundabout. So we followed Dave Wi up the A19 and experienced the subway – well recommended should you have to take the A19 out of York. About a dozen riders gathered at Low Bridge and the question on everyone’s lips was “How’s Phil?” after his accident during the week. I explained what happened and was pleased to be able report the latest news that he is on the mend, to a collective sigh of relief. The EG’s thoughts are with you Phil and we are looking forward to your return. So a slightly delayed start and the decision on the route was similarly postponed by deciding to decide at Wetherby Morrison. 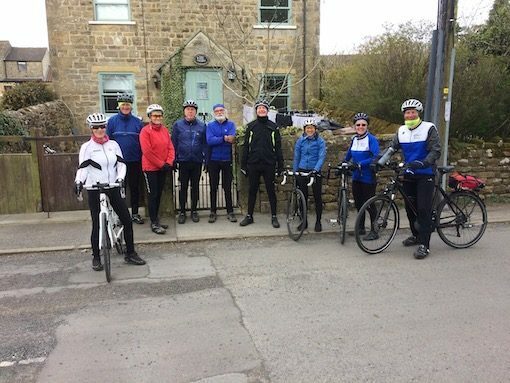 There was a definite nip in the air as we traveled the usual route towards Wetherby the group splitting up which was no bad thing given the size. We gathered at Morrison, where the tea cakes seem to have shrunk somewhat, and the EG’s as ever filled the air with conversation and banter. I was awarded membership of the B team and set off with Dave P, Norman and Bill but not before Eric had bought a get well card and everyone had signed it. 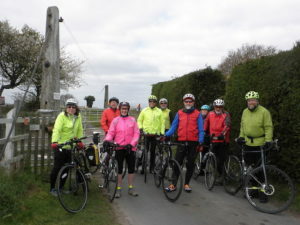 The A and B team headed down the cycle path towards Thorpe Arch and disentangled themselves as they emerged onto Wighill Lane. The B team led by Norman headed for Tadcaster as the A team disappeared into the distance. In Taddy our route took us at a leisurely pace towards Bramham avoiding the busier roads. It was good to have the cold breeze on our backs and promises of things to come when the sun broke through the clouds. 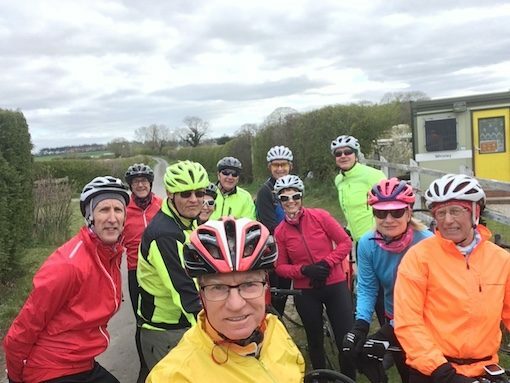 Norman’s route finding as ever was top class, having passed through Bramham we used the cycle path north parallel to the A1 and then after some hesitation from Bill along the woodland path. Norman assured Bill that he would mend any punctures acquired by him. Such generosity, this was an education for a ‘usually in the A teamer’. The group stayed together through out, the pace comfortable enough to hold converstaions and stay as a tight group. We returned to Morisson, in spite of my doubts about the teacakes where we answered questions from some visitors from Leeds about cycling in general and our group in particular. With frost on the cars it was a chilly start for the riders gathering at Hornbeam for todays ride to Greygarth. James managed to entice 6 riders to join him with another 4 being picked up at Ripley where the final route to Greygarth would be agreed. A quick ride down the Greenway to Ripley and an easy decision to go via Sawley and have an early coffee at G and T’s. The climbing started to warm us up but it was still cold and Stuart called it a day at the Sawley turn off and headed for Fountains for coffee and a lower route back home. The remaining ten were soon huddled in the cafe with their hot drinks and calories to help them through the rest of the day. Reluctantly everyone left and climbed Sawley Bank….and kept climbing up to Gallowgill. On the way the sky cleared and the sun burst through and we had some good views across the moor- including glimpses of Roseberry Topping. We pushed onwards(and upwards) and reached the monument in bright sunshine -but there was still a chill in the air so we didn’t climb the Tower but set off back. We had planned a second stop at Fountains Abbey and we headed off via Laverton,Winksley and Aldfield and were soon heading into the cafe. We were joined by Richard Pugh who had spun off from the Medium ride fast group to do his own thing and was on his way home. 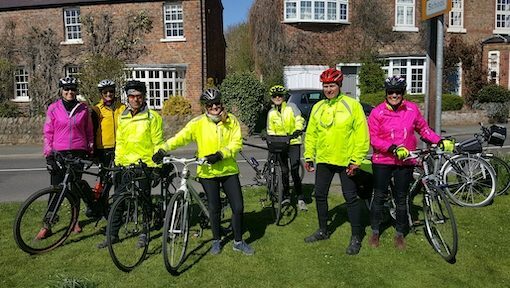 We decided the final leg was by the shortest route possible and so we set off up Watergate Lane and then headed to Ripley and the Greenway home. Brief glimpses of two EG’s was had on the Greenway before we all departed our separate ways home after a really enjoyable ride of 42 hilly miles. The weather had worked for us and despite the cold early on everyone who had opted for this ride felt it was the right decision. Well done to Alan S who completed his first ‘Greygarth’ ride – but he has to do it again so he can claim his medal!